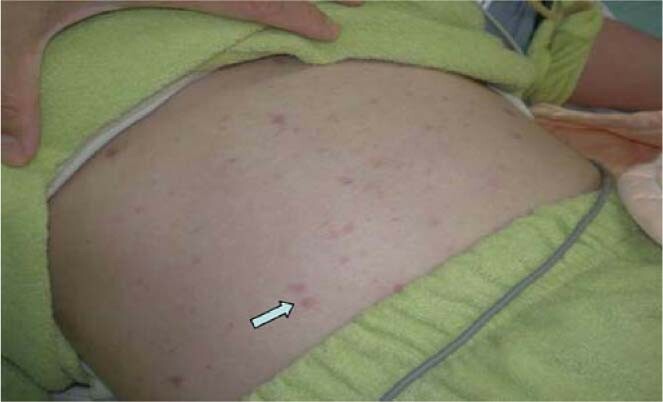 A 31-year-old woman without history of systemic diseases presented to the emergency department with spiking fever, chills, generalized myalgia, severe epigastralgia, and watery diarrhea for 1 day. Flulike symptoms had been noted for several days. Progressive extension of petechiae skin purpura (Fig. 1) developed within 2–3 h upon arrival at the hospital. Low blood pressure persisted despite vigorous fluid resuscitation. Laboratory results showed bandemia without obvious leukocytosis, low platelet counts, severe metabolic acidosis, and prolonged prothrombin time and partial thromboplastin time. 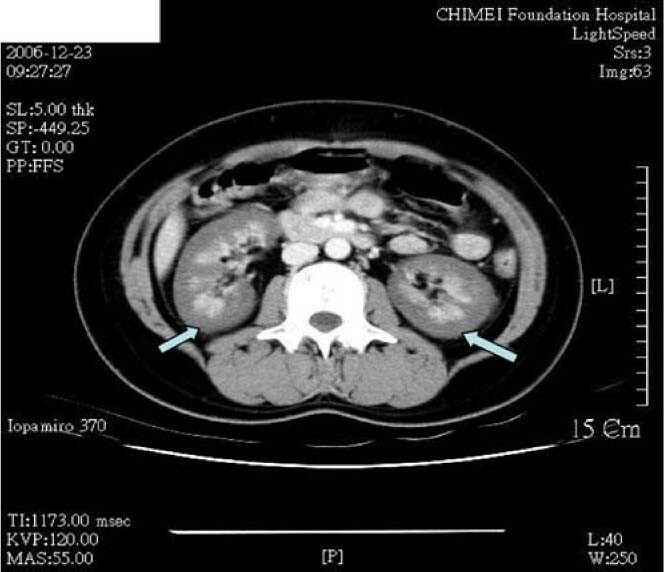 Computed tomography of the abdomen was arranged to search for a possible intra-abdominal lesion, which could be causing the septic shock and severe abdominal pain (Fig. 2). The patient died after approximately 10 h of vigorous fluid resuscitation, inotropic agents, and antibiotics with quinolones. No emergent dialysis was arranged. We report a case of bilateral cortical necrosis caused by fulminant meningococcemia. Bilateral renal cortical necrosis was first described by Friedlander in 1883 . It is a rare and usually irreversible cause of acute renal failure. Most cases are observed in connection with obstetric complications, but it may occur in nonobstetric diseases and concomitantly with septicemia caused by various organisms, including Neisseria meningitidis . Early administration of antibiotics and plasmapheresis are the treatments of choice in the fulminant stage of meningococcemia .